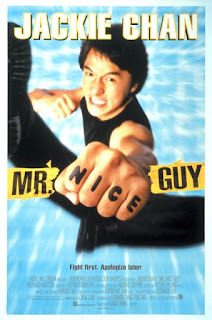 Mr. Nice Guy was one of the last Jackie Chan films to be released theatrically in the U.S. and that was a shame. Sure, the films that Chan were making were not as good as his output in the 80's and early 90's but it was always nice to see a Jackie Chan film in the theaters. Mr. Nice Guy is yet another film where Jackie finds himself in the middle of the good and bad guys. This time he is a chef who has a tv show in the mall. The story is flat and boring, but Chan gives us some good fight scenes to tide us over. The fight scene at the construction site is the highlight of the film, but there are also some nice fights throughout. The film was directed by Sammo Hung who also has a cameo as a bike messenger. It is always nice to see Sammo and Jackie together. Too bad that they would fight together on screen until 2004's remake of Around the World in 80 Days. One more note: the song used in the trailer is a song called Semi Charmed Life and is about doing chrystal meth. A fitting song for a Jackie Chan trailer.